Complete peace and seclusion only two hours from the George Washington Bridge! Relax on the back porch while listening to the sound of the babbling brook, or have a few drinks in the gazebo overlooking a private pond. You won't want to leave, but in case you do our cabin is only 5 miles from downtown Narrowsburg where you'll find restaurants, shops, galleries and bars, and 10 miles from the Bethel Performing Arts Center. Go see a concert where the Woodstock Festival was held, or enjoy canoeing and rafting on the Delaware River. There is no CD player but there's an iPOD dock. Perfect cabin to spend a weekend catching up with friends. Hot tub and fires, everything you need! We rented the cabin for a girls' getaway weekend and it was just what we were looking for!​ For the 3 of us, we each had our own bedroom and the beds were very comfortable. The kitchen had everything we needed to cook any meal and there was a fireplace with plenty of wood to keep a fire going. The property and setting was so beautiful and the best part of all was the huge outdoor hot tub that we enjoyed sitting in while surrounded by snow and pine trees! The town center was less than 10 minutes away and we really enjoyed dinner at Uncle Vinnie's! Highly recommend if you're looking for serenity and privacy. The trip was wonderful! The whole time it was a bit gloomy and raining so we didn't get to explore outside too much. Over the cabinet so was like what they spend the week in. It was the perfect wnviornment to get away from stressful day to day lives and play board games with friends. There was no cell service there but that was a positive in my opinion. My friends and I had such an amazing stay at this house and will definitely try to visit again. We attended an event at Bethel woods, which was only about a 15 min drive and then were able to have a relaxing weekend at the house. The house has everything you would possibly need! 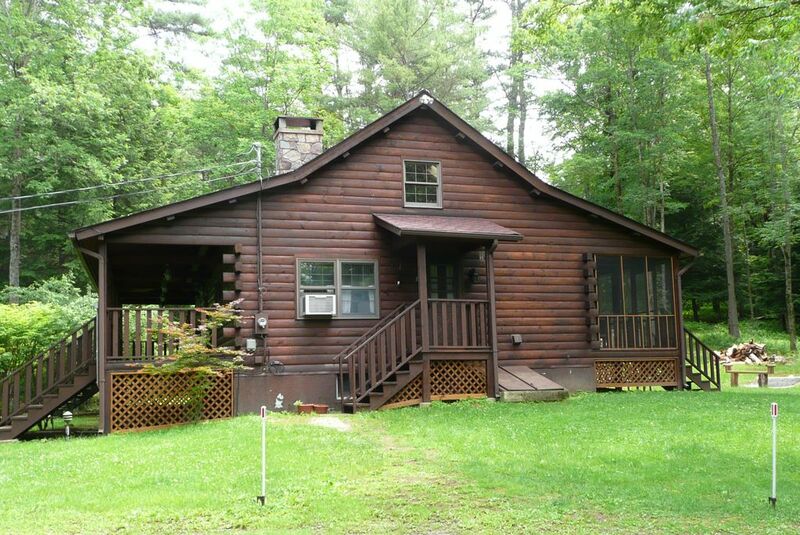 Private wooded setting, this is a clean, simple, very chill and comfortable cabin. great outdoor firepit and hot tub (bring your own dry wood as the outdoor wood pile can be damp depending on weather) great screened big porches. I appreciated the ample seating in the living room with 2 cozy couches and a couple armchairs. Secluded, and a little pond with a gazebo to hang in. The decor is a little outdated and spartan but very spotless and comfortable. What you want in a woodsy cabin. Great location- my favorite part was the sound of the rushing creek in the backyard. one minor flaw: the shower didn’t have great pressure but that’s a personal obsession of mine, and most people would find it perfectly adequate. Stocked with everything you would need. A great find! Narrowsburg is a small town situated on the Delaware River in the area between the Catskill and Pocono Mountains. Only two hours from NYC, it's the perfect country escape for canoeing, fishing, sightseeing, or simply enjoying the peace and quiet. Narrowsburg also has a strong arts and cultural community. It is the home of the Delaware Valley Arts Alliance, the Delaware Valley Opera and the Tusten Theatre. It is a short drive to the Bethel Performing Arts Center, the Monticello Casino and Raceway, and the Forestburg Playhouse.